We have designed a new framed Laser Harp model that will not look "Framed", with the harp being all stainless steel in construction. The design has a waist high stainless steel control console, that is only four inches deep, by fourteen inches wide, by 5 feet long. The control console is supported by stainless support pieces that angle out as they stretch up to 10 feet above the players head, until they terminate at 12 feet wide at the top, where a connecting piece ties them together. The 8 green lasers ( can be set up with Green or Red Lasers, or a mixture of both), shine up in a fan shape from the control console, to terminate at 8 optic sensors on the top piece. The lasers also will produce visually pleasing 'over splash' of green laser light, flashing over the heads of your audience, reflecting off the top Stainless Steel cross piece. The lasers are triggered by breaking the beams at any point in their transit to the optic sensors, triggering any type of media, audio or visual , in loops, sequences, single note/ sound, up to 70 times per second. The fully programmable software is installed in the compact lap top computer that is installed in the control console( removable for transport). The software includes a wave file editor and a built-in synthesizer. The lasers can also be reflected to additional optic sensors that are mounted in the control console surface, using the analog effect of changing voltage produced by different levels of laser light reflected to these sensors. This analog aspect of the software can produce variable pitch and volume change in the already triggered sounds and sequences produced by breaking the beams that shine at the top set of sensors, as well as additional variable sounds and image projections. This reflecting can be done with just the bare hands, though reflective gloves can be worn to add to the effect and visual appeal. ( The low powered lasers used are considered safe by the US FDA, to interact with, with bare hands).The reflected green laser beams also will flash off the Stainless Steel control consul surface, adding additional flashes of brilliant green Laser Light. There is in addition a set of four control buttons or pedals that can be triggered to change the programming of all 16 sensor channels to an entirely new set of music/ sounds/ notes/ video and still imagery. Visual imagery and audio sounds can be triggered at the same time in all channels. Imagine,..... eight Green lasers shooting up in a spreading fan of brilliant green Light, to sensors overhead, and the stainless steel top rib reflecting and splitting the over-splash of the beams to shine all over and above the audience in a performing space...you break those beams, trigger waves of music chords, sounds of space and nature, while also with the same beams triggering visual projectors to display large images moving on the scrim at the back of your stage,...... while the Brilliant Green Laser Beams you are breaking are also being reflected to other sensors on your control console to trigger secondary programming, including volume /pitch change via the level of reflected Laser Light. All the while, the over splash form the Green Lasers is flashing off the highly reflective Steel. The software we use has the capacity to respond to a break of a laser beam up to 70 times per second. You can program up to 60 events per 'song', with an endless number of possible 'song' combination of any type of audio-visual event, image, video, sound sampled wave files, etc. The software is fully programmable with an on-screen syntheses and wave file editor, available to pre-program an endlessVarietyy of sound and visual scapes of any type of audio or visual event file or element.. This Laser Light Harp model will have 16 channels available. Our software can control three LCD or other type of projectors from one lap top, computer when an extra video card is installed. This all Stainless Steel, modular/foldable, compact for transport Laser Harp, with 8 Green and/or Red lasers and 16 audio/visual trigger channels, fully equipped with laptop computer & software multimedia controller system, can be custom ordered for US$19,000. Shipping is extra. 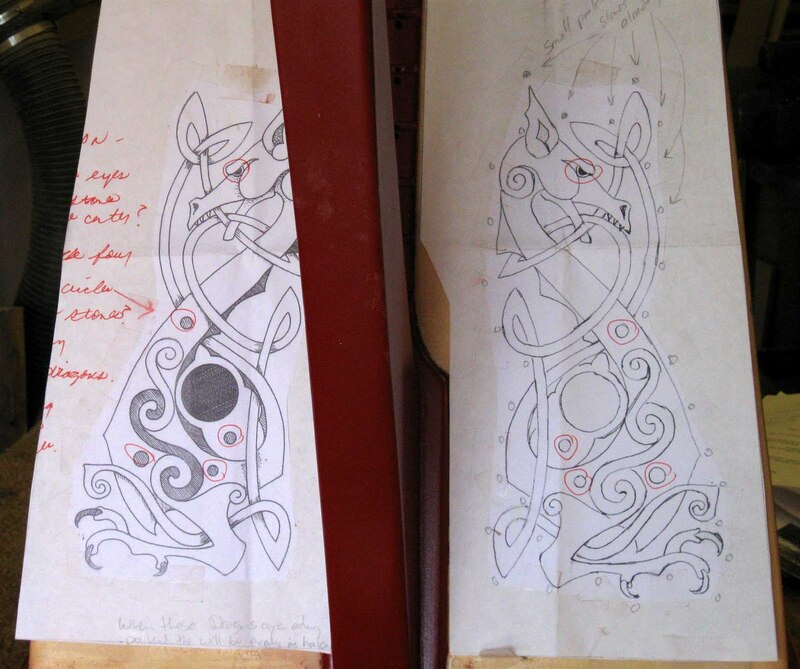 For installation in your Science or Children`s Museum, we can design a compact lap or floor sized laser harp that looks just like a harp. The cabinet and Harp are both constructed form very durable Rock Maple, finished with tough Poly finish, and can be colored with a wide range of colored stains or tints. We can build for you a compact self contained unit of a beautiful hardwood base cabinet that houses all the electronics, computer and stereo sound system, with a Laser Beam Light Harp mounted securely to the top. This option is all self contained, needing only a AC power jack in the floor below the cabinet ( either 110 or 220, a step down transformer will be supplied in the case of 220 power). This Laser Harp comes with full instruction/installation manual including photos, and is 'plug and play', with full functioning assembly taking only an hour or two. The software we use has the capacity to respond to a break of a laser beam up to 70 times per second. You can program up to 60 events per 'song', with an endless number of possible 'song' combination of any type of audio-visual event, image, video, sound sampled wave files, etc. The software is fully programmable with an on-screen syntheses and wave file editor, available to pre-program an endless Variety of sound and visual-scapes of any type of audio or visual event file or element. The software comes with many pre-programmed 'song' selections, and is fully custom programmable for your needs. This system with 8 red and/or green Lasers, comes fully equipped, ready to 'plug & play', for US$14,800 . Shipping is extra, but with a compact shipping crate, can be easily shipped worldwide. 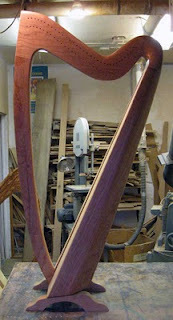 Completed Cambria 34 Harp, Cherry wood, Spruce Sound board, full set of Camac levers. This is a completed Cambria 34 Harp, built from all solid Cherry wood, with a solid Spruce Sound board, and a full set of Camac sharping levers. The strings are nylon, with wrapped metal base strings, with a note range from fifth octave -C, up to A.. The string tension is medium-high, typical of most of the lever harps being played today. The string spacing is a comfortable spacing that any harpists can play easily, not too wide or too narrow. We sell these harp models in three sizes, 22, 29 and 34 strings, and the 22 string model is also available in a wire strung version. The 29 and 34 string models are available in four different stages of construction, as well as just blue prints and instruction manuals. 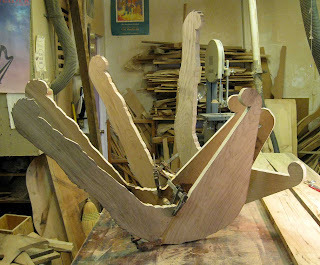 The 22 string models are just available as Stage I kits, which consist of everything a builder needs but the wood. The 29 & 34 string kits are also available this way. A Stage I kit can be easily sent anywhere in the world, since the package is very compact. 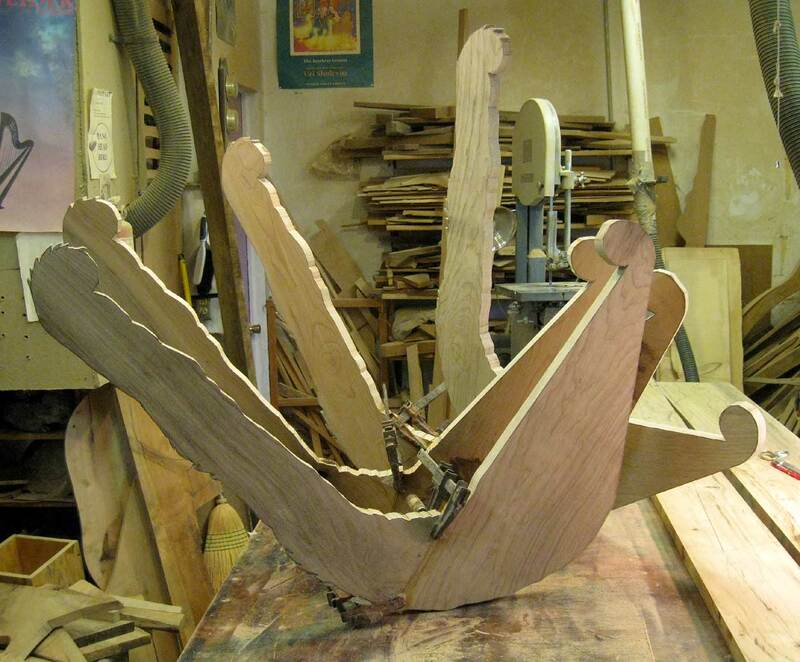 The Stage II kits for the 29 & 34 have all the wood supplied, with some of the hardest parts done. 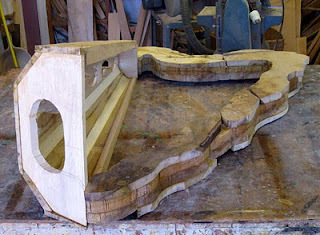 All the pieces are cut out, and the sides of the sound box are glued to the end blocks. The Stage III kits come to the builder almost finished, with only two small glue joints to assemble. 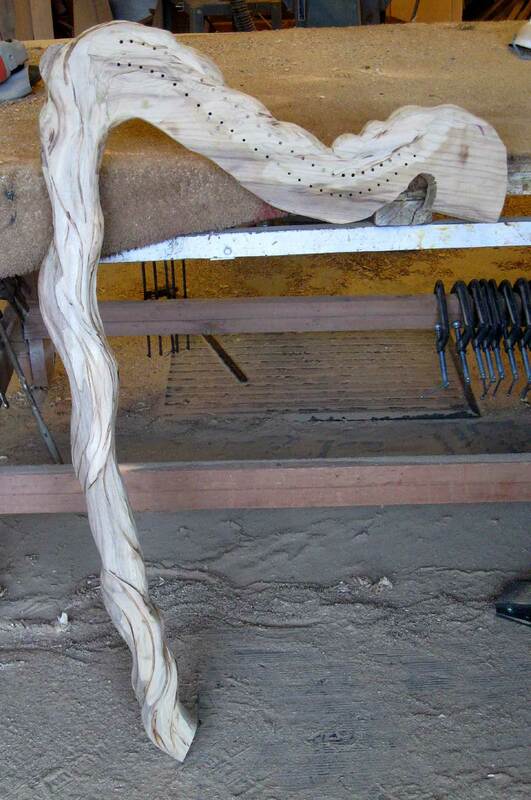 All the hardware and string holes are pre-drilled and tested. All the rough sanding is finished for you, with just the fine sanding and clear lacquering to be done, along with the hardware and string installation. The fully complete Cambria 29 & 34 models are our Stage IV kits, ready to be played! The sound system is dual output stereo/mono, using the individual RMC string transducers. This is the same system that Lyon & Healy uses on their electric harps. It is for sale ...for $4,900 plus shipping from the SF bay region of Northern California. 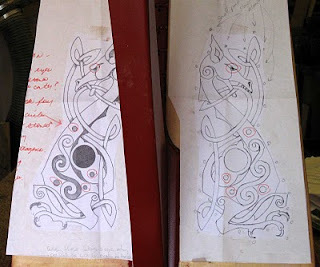 Please contact me for information on how you may contact the owner, to talk to him, or to see and play this harp in person, if you are in the area. 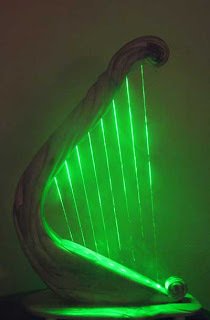 Custom Carved Myrtle wood Laser Harp with 8 green Lasers. 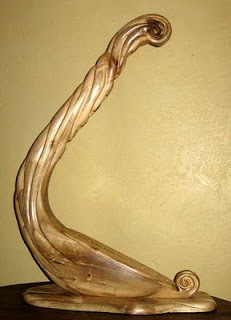 This is a Carved Myrtle wood Laser Harp with 8 green Lasers. Here shown both with fog and the lasers running, and with no fog and the lasers turned off. I rarely build a Custom Harp that has not been commissioned. But this is one I just built in the fall of 2009 to show at a Science and Technology Center Conference in Texas. 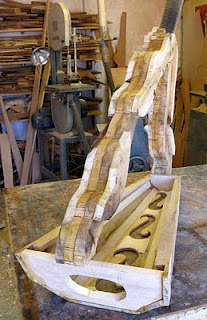 It is styled a bit like one that I am building for the 'Jewish Children`s Museum' in NY, NY. 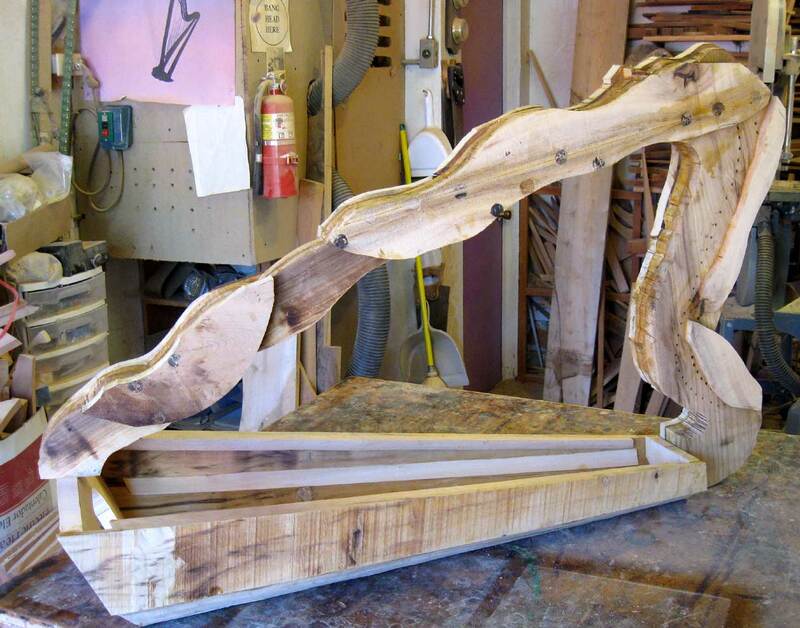 That commissioned project will be carved to look like the harp was carved from an olive tree trunk/branches , with lots of Organic detail. 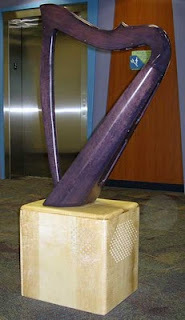 This harp is about 38 inches tall, designed to be installed on the top of a display cabinet or counter, about four high. The supplied software and midi controller will respond to breaks of the laser beams up to 70 times per second. Up to 60 sound or visual 'events', can be programmed for each laser beam, and their is a supplied four-button control box, that can be mounted with the harp, that allows museum patrons to scroll through as many different programs as you desire, or both sound and visuals. The system can control up to three LCD or similar type projectors, via a computer, to allow the lasers to trigger still or video images. With three projectors you can create almost a full immersion experience. The lasers and sensor as both mounted in such a way that they are protected from damage via exploring fingers or other objects. Please see my Laser Harp page for specs on all the midi/multimedia control equipment and software that is included with this Laser Harp. It is currently for sale and available for $15,000, complete with software and all multimedia control equipment, ready to hook to a Laptop computer and sound system. 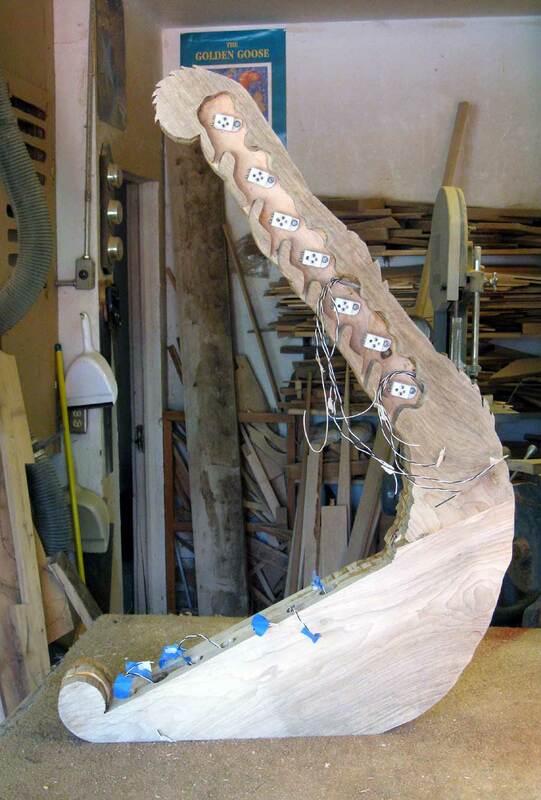 his harp shown above is a wire strung harp built from Birds eye Rock Maple with a solid Spruce sound board a full set of Loveland levers. 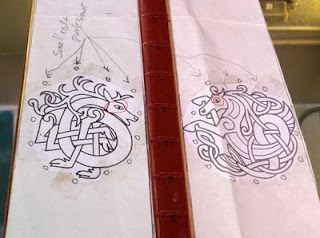 these is also colorful Celtic designs painted on the sound board. It is in Brand New condition. 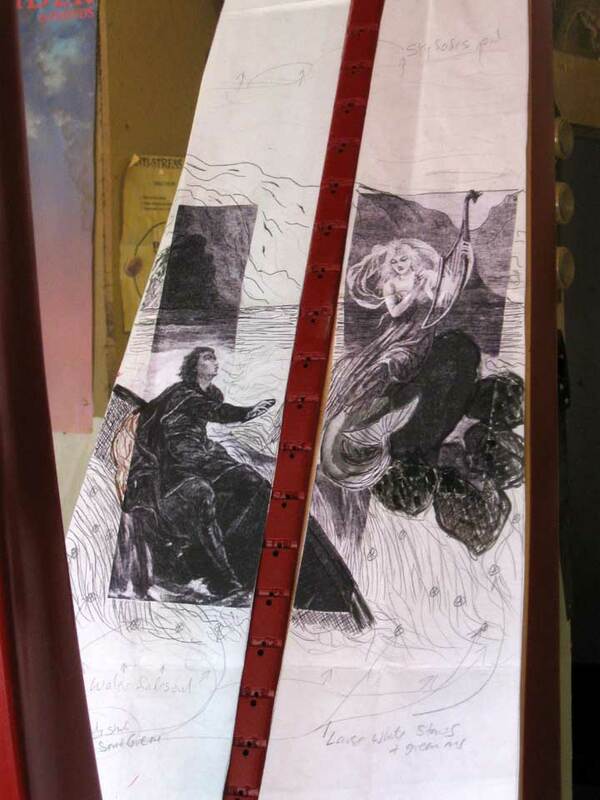 I am creating a design/drawing for a client today in my shop, for a large Double Pentatonic harp. 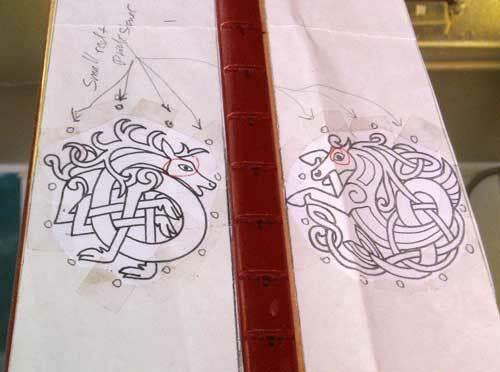 It will have 5 octaves, with 60 strings in total, set up with the longest string in the middle, and then with two identical string sets in one line going out from that middle string, like a mirror image of each other. These nylon and composite metal strings will be set into an oval neck frame, with the sounding box at the bottom of the harp. It will be about 68 inches tall. 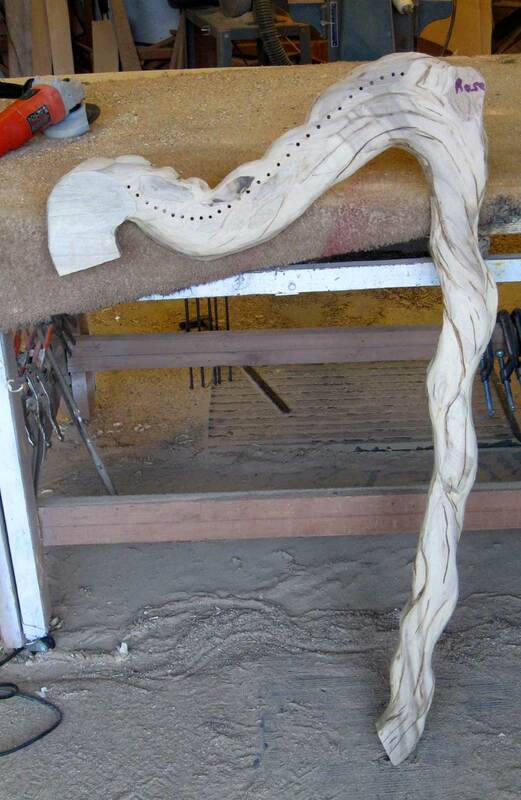 the tuning pegs will be in the top of the neck, along with bridge pins. There will be no levers, since the tuning is to be only played pentatonic. New web site up and running !! 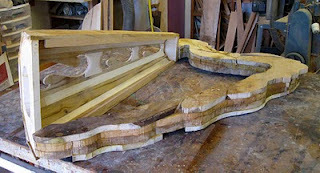 New photos of harps under construction too ! And here are a couple of shots of two harps on my workbench that are almost finished! One is a 34 string Cherry wood harp that will be nylon strung, with Camac levers. The other is a Carved Cherry wood 33 string nylon strung acoustic-electric-midi harp, that is also set up with 6 green lasers. 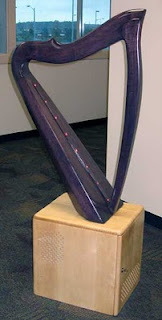 This is a first of a kind hybrid string/laser harp that anyone has built. It has the capacity for each string to send out a midi signal coded to the string`s pitch, that can allow the harp to play any sounds to go with the strings, in harmony with those notes generated by the strings. There is a set of 7 triple slide switches , that act as 'midi pedals' to sharp or flat all the midi signals for all the C`s, D`s, ect, so that the midi signals are the same pitch as the strings are when their levers are flipped up. The lasers will allow the triggering of any back ground musical or natural sounds, and /or projected video and still images, to go with the music being played. 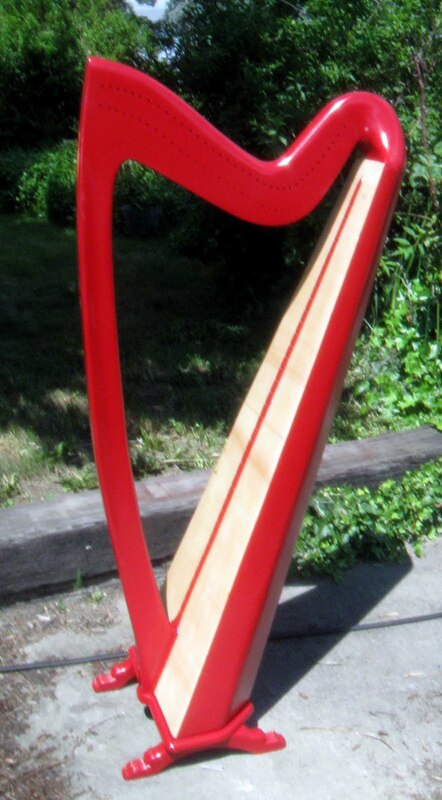 This harp is a custom creation for a Harpists who plays Nature oriented Celtic music. So for example she might be playing Celtic music while she is triggering back ground sounds of ocean waves, while one-to-three LCD projectors are showing video of a seas shore scene. The multimedia controller that goes with the Lasers actually has 12 channels available , with 6 being used by lasers, and the other 6 being used in this harp by a multi-channel midi pedal. 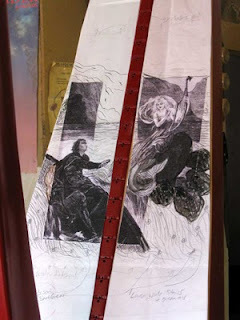 the Harpist will be able to use this pedal to capture and trigger loops of music she has just played, to accompany herself. The triggering can be via one of the lasers beams, that can have up to 60 sequences of sound or images programed on it. The Lasers will also react to their light being broken, to trigger sound or video, up to 70 times per second.